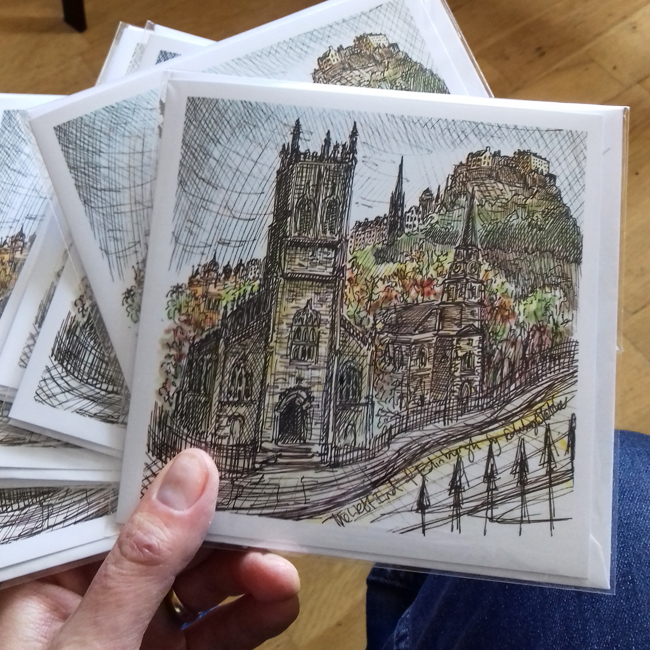 To celebrate sketching a window display in Edinburgh’s West End I have created a number of gift cards featuring my design. 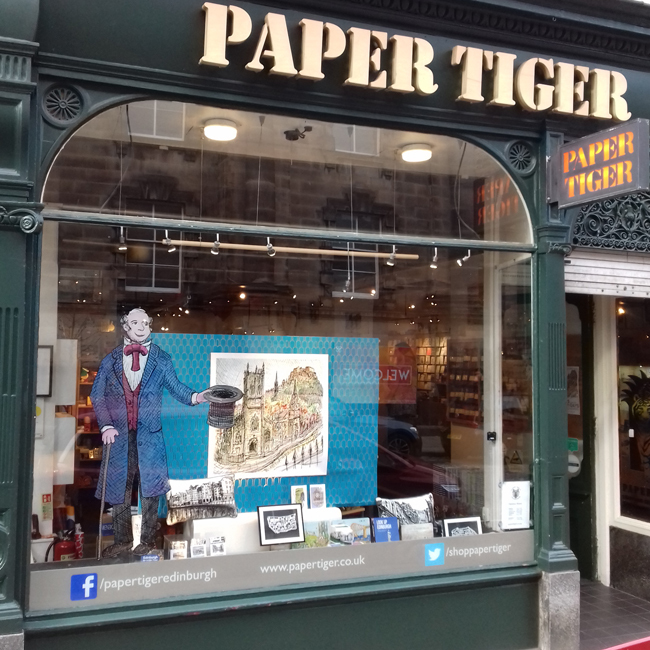 When I was asked to draw onto the glass window of Paper Tiger’s Stafford Street shop I jumped at the chance, it is great to see my sketches so big and a challenge to create something new each time that attracts the eye as people pass by. We created a three dimensional effect by drawing part of the image (a portrait of John Scott Russell – a former resident of the Stafford Street building) directly onto the glass and then creating a background drawing featuring the local area to hang inside, behind the portrait. The image above shows the finished window which I think works really well. I used posca markers to draw the outline and then poster paints to add the colour. The background image of the West End features Edinburgh Castle above St Johns Church and St Cuthbert’s Church, which lie on Lothian Road. The sketch is slightly stylised with the hill to the castle exaggerated to give each of these fine buildings their own space. 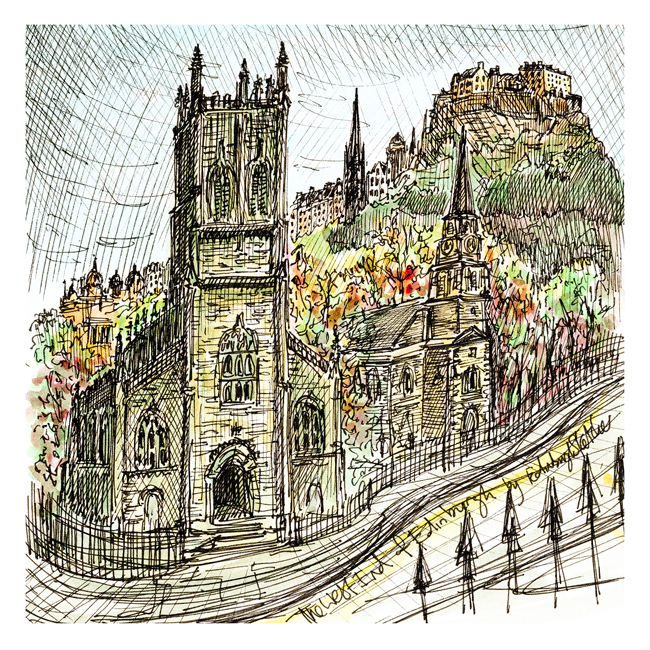 This sketch is now available as a 140mm square giftcard HERE and also from the Paper Tiger shop on Stafford Street.